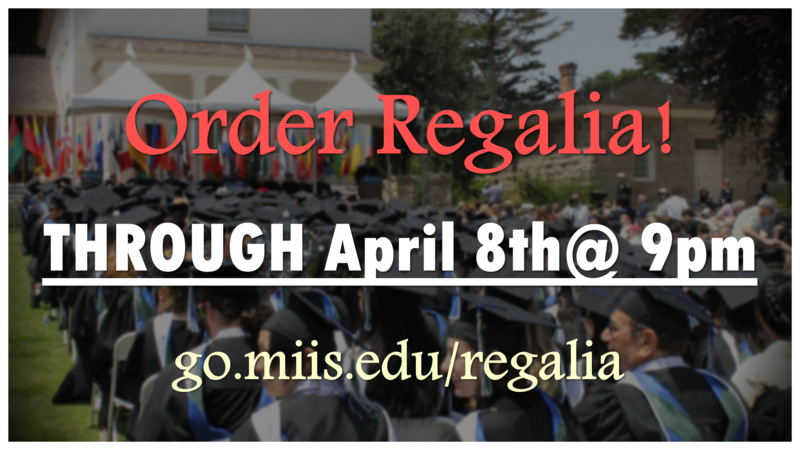 MIIS Student Services » Order Commencement Regalia Now! Spring Graduates – Order Your Regalia Now! You may now order your Commencement regalia online at www.collegegrad.herffjones.com. Simply enter “Middlebury” in the search box and follow the prompts to complete your purchase. The deadline to order is Friday, April 8th at 9pm (PST)! If you are unable to order online with a credit card, you may place your order in person at the Office of Student Services and pay with cash or check. Regalia is not mandatory for the ceremony; students may opt to wear business attire or traditional dress from their native countries. Regalia will be available for pick-up in the Office of Alumni Relations beginning Monday, May 16th (email notification will be sent out). Lastly, all graduating students are required to attend the Graduating Students Meeting on Thursday, April 7th from 12:10-1:30pm in Irvine Auditorium. Older: A Day in the Life of Peter Seilheimer! Newer: A Day in the Life of Weiwei Xie!